In the 19th and early 20th, flour sacks were widely used, not just for holding cooking items but numerous other functions such as dish towels, diapers, pillow cases, hand towel, etc. The reason behind their popularity is because they were handy and light-weight for a wide range of tasks in the kitchen and beyond. Until this day, manufacturers have cleverly upgraded these towels to roughly material that are commonly available, inexpensive and well-suited to a multi-purpose household application while still keep the characteristics that made them popular in the first place. 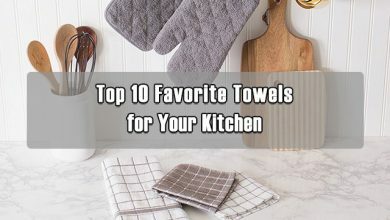 To help you gain a better look into what are some of the best flour-sack towels available out there, here’s a list of my favorite flour-sack kitchen towels for your reference. Let’s begin, shall we? This list wouldn’t be complete without this Utopia Kitchen 12 Flour-Sack Towel Pack! 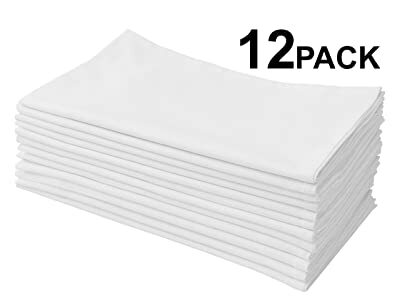 This 12-towels pack provides you with an ample amount of flour sack towels to cope with all your household needs. The long-lasting yet soft and absorbent cotton fabric makes them perfect for kitchen drying uses and counter wipe downs. These are outstanding quality flour sack towels and at such competitive price. The edges are well-hemmed and the packaging is adorable and thoughtful with a useful button-closure strap. This Utopia towel sack will make a lovely present for the important people in your life. One advice is to avoid using chlorine bleach since it might eat up the fibers more quickly, making them thinner over time. Another thing to stay away if you want the towels to retain its absorbency is fabric softener, as it will cause them to repel water. If you’re looking for plain white towels for your embroidering projects, this pack would be a great idea. They are decent weight and hold up beautifully after embroidering without distorting like other thinner, lower quality towels. In the kitchen, they are used to dry dishes, mop up water spills, cover food items or wrap clean vegetables for the refrigerator. Or, use them to clean windows and dusty furniture without fear of them scratching the finish or surface. And when the towels finally wear out, hand them to the guys to use in the garage or garden for cleaning tools and cars. What more can you expect from a dishtowel? You are bound to love these flour-sack towels. 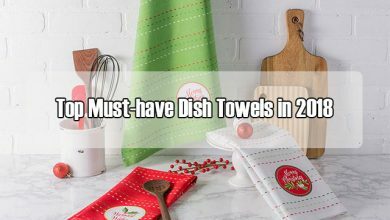 Put away the tired, worn-out dishcloths and ragged bath towels that don’t deserve a place in your kitchen. These Nouvelle Legende Cotton Flour Sack Towels is the real deal. Smooth, absorbent and high quality are what I can say about these towels. 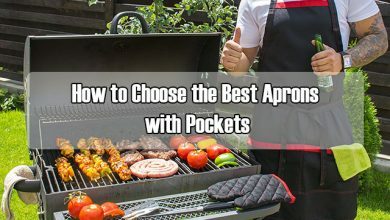 They are large enough so you can use them like real chefs do – fold them and pick up cast iron pans from the oven or pick up a hot baking dish by both handles. 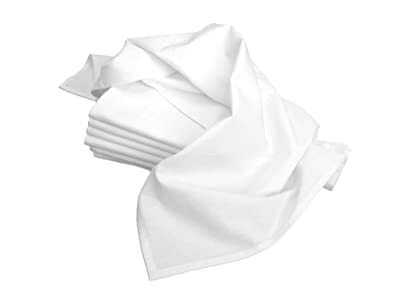 The towels are soft enough to be used on glasses or computer screens but tough enough to wipe up kitchen spills. 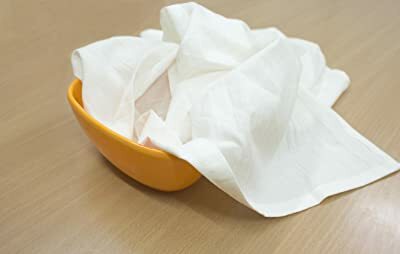 Clean up your messes with these flour sack dish towels and you’ll gradually “go off the gird” on paper towel, which not only cuts cost but also saves the environment. The durability of these towels is also worth some praising. The towels can be dyed into different colors and will retain the shades after many washes. They will not fall apart, get any fuzz balls or alter their shape after washing. The towels might seem a bit stiff when purchased but will soften out and still remain absorbent after several times in the laundry. They absorb an incredible amount of water and still provide enough drying ability. You can save water from running all over the other already dry dishes, keeping your kitchen nice and clean. 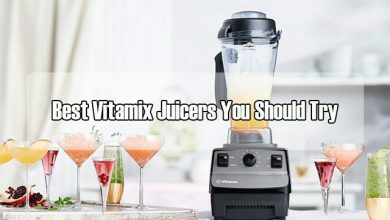 They can be used for drying fruits, vegetables, wiping up small spills, dry dusting TVs and computer screens, windows and mirrors. One downside is that they might be thin for some people, so consider carefully before purchasing, especially if you’re looking for towels to embroider on. Bring back the kitchen of your childhood with this Aunti Em’s Kitchen Vintage Flour Sack Kitchen Dish Towel Set. These towels are made of 10% lint free, natural cotton, making them excellent for drying glassware and dishes. All 4 edges are hemmed and there is also a strip of cotton taping on one corner for hanging. The fabric is crisp and easy to work with, perfect for machine embroidery designs. And there’s no need for ironing or washing before embroidering. Should, for some reason, you find that the towels are too wrinkly to do so, simply spray-starch them using the steam function of your iron. The towel will lovingly accept both the decorative and embroidery stitches. These flour-sack kitchen towels have the perfect size for a kitchen drying cloth. One notice is that there might be some slight shrinkage after each wash, from 27’’x27’’ to roughly 26’’ or 26.25’’. I just adore the fact that there’s up to 13 towels per set! And a pack of 13 means there will always be one right at hand for your convenience. With such nice quality, who would have guessed they’re only $2 each! If you’re looking for even better priced kitchen towels, this Royal Classic White Kitchen Towel Pack would be my pick. 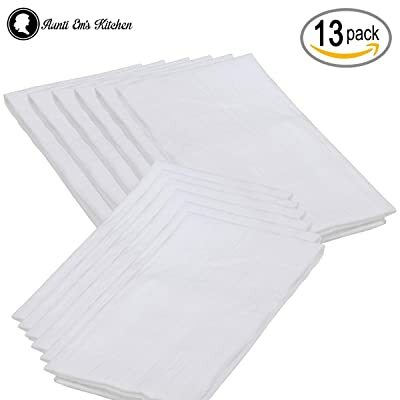 The 15-pack ensures there’s plenty of towels at hand for your cooking and cleaning needs anywhere in your home or workplace where spills are common. With a generous size of 14×25 inches, this flour sack towel can handle all the cleaning with ease. 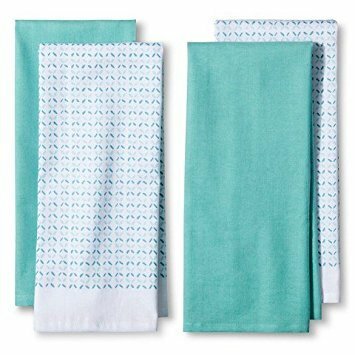 These 100% natural cotton towels are lint free, perfect for drying your fine silverware, plates, pots and pans without scratching them. The weaves are tight, durable and built to last long. The blue stripes definitely add some decorative touch to the towels, setting them apart from other normal plain cloths. And rest assure that these stripes will not bleed out even with fabric bleach. What’s more, these tea towels are super absorbent and dry quickly, lessening the rash of mildew or bacterial build-ups. They do somewhat stain with active use, but most stains do wash cleanly out. And the stubborn bit left can be considered proof of a well-used and happy kitchen! One downside to this product is that there might be some loose threads after several wash. Still, this is a great alternation from terry cloths. Plus, 15 well-made towels for only $1 each? Sign me up! Another suggestion from me would be this Aunt Martha’s Flour Sack Dish Towel Pack. The cotton fabric definitely gives the towels a smooth texture without many wrinkles. 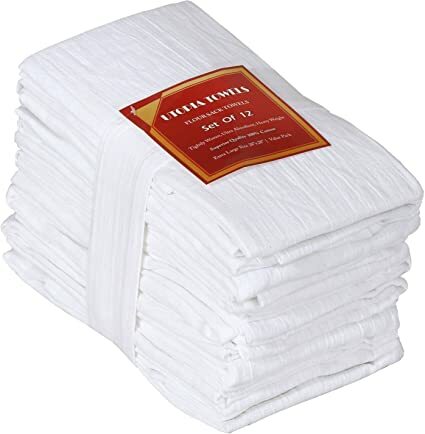 The towels are heavy weight and evenly cut with strong sturdy seams. And the weaves are much tighter than a typical flour sack towel. If you’re living in a region with humid climate, you will most likely fall in love with these towels. Traditional fluffy bath towels, in such situations, will take forever to dry, which makes them go sour quickly and sometimes permanently. These towels, however, are perfectly absorbent and quick to air-dry after every use. They even stay crisp and fresh for your next use! Plus, the fresh white and nice hems on these towels look great hanging in the bathroom, thanks to the help of a back loop. What’s more, the towels will make a wonderful needle-worked gift for your special someone. These will last for a very long time and will not stretch out noticeably by your sewing hoop. The receiver will appreciate such gifts much more than those already made at a store. There are only 7 items per package instead of 12 or 13 likes in some other brands. But having to use 2 or 3 of these high-quality towels to get the job done makes them a somewhat better investment. This flour sack towel can service you in every task necessary, from drying dishes or vegetables, embroidering or being used as bath towels. In short, try them and you’ll see what I mean. 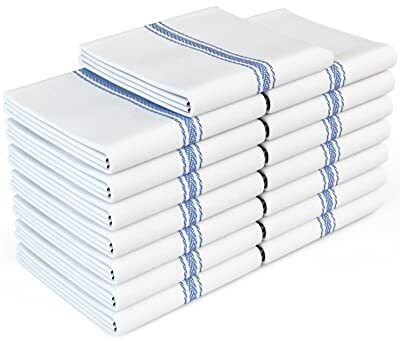 If you’re looking for a suitable towel for you embroidering projects rather than dish towels, these Cotton Craft 12 Pack Flour Sack Kitchen Towels would be my pick for you. These towels have very nice quality with straight and even hems. Each cloth is perfectly square and has a loop for hanging up. The ringspun cotton fabric that made the towels is thick and heavy. This is also considered a minus to some who found them too stiff and not so absorbent to be treated as daily kitchen towels. For embroidering purposes, these towels work like a champ! They can tolerate designs with over 30 000 stitches of machine embroidering. And the tight weaved fabric does a great job holding the stitches far into their lifetime. Despite the negative comments, the towels still make a rather good kitchen cloth, being sturdy and not so soft that they go lump after drying the first glass. They are stiff at first, but a few washes will take care of that and they will become noticeably softer and more absorbent overtime. It’s no mean feat to find such heavy-weight flour-sack towels embroidery at such affordable price. Overall, this item is surely a great option that is worth considering. This list wouldn’t be complete without this first-class Cotton Kitchen Napkin Flour Sack Towel Set. 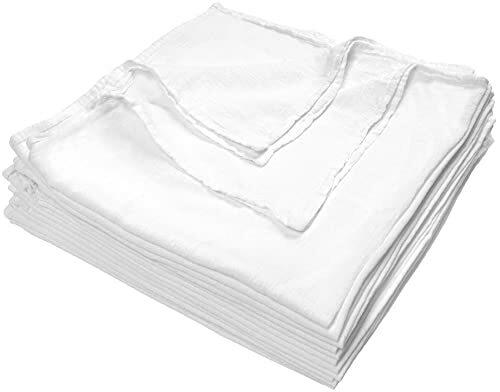 These flour sack towels are made of premium ring spun cotton in 130 thread count, giving them a nice absorbency. They will still dry themselves quickly after some hanging and won’t produce any undesirable lint. The quality of these towels is top-notch, with a nice and thick border that won’t curl up after several washes like some towels out there. Not to mention the amazingly huge size of 33×38 inches. Some might even mistake these towels for table cloths! The towels were lovingly packaged with a long bow and a waterproof tag listing washing instruction. Speaking of washing, rest assure that there will be no shrinking and the towels will get even softer after each time in the laundry. These premium quality flour sack towels have proved its popularity among home cooks as well as gourmet chefs and have served a variety of purposes. They can be used to proof bread, strain sauces, make cheese and bread, wipe fruits and veggies, or as informal dinner napkins. The towels are sustainable and lint-free, perfect for cleaning, drying and polishing household things. Also perfect for sewing your embroidery on to give away as gifts. If you’re concerned about the rather large size of these towels, my advice would be to cut them in half. You will then have 14 towels with the same quality to abuse to your own liking! So, what are you waiting for? Tired of the same old white kitchen towels and in need of a change? 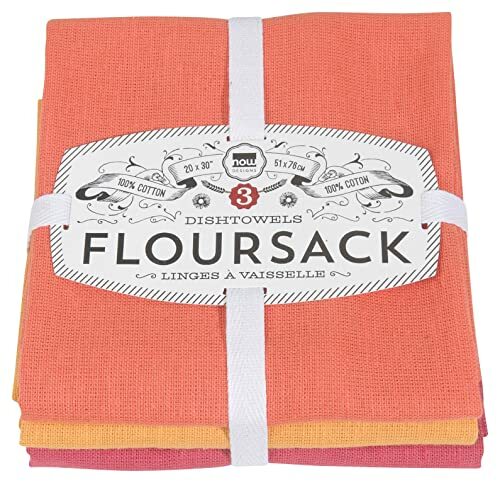 Try considering this Now Designs Floursack Kitchen Towel Set. These towels are made from 100% cotton and measure a generous 30 x 20 inches in size. 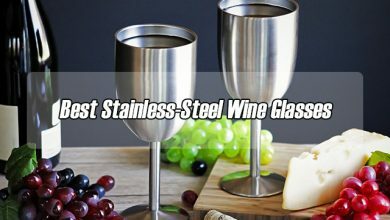 They are light weight and lint free, making them a great kitchen towel for stemware, glassware and other delicate tasks without leaving any annoying streaks afterwards. 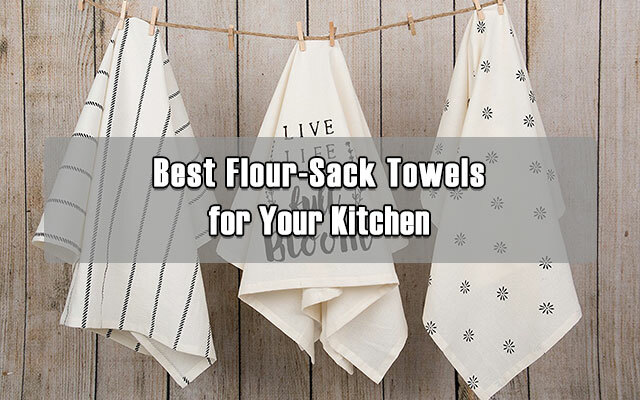 The flour sack towels are actually great for drying your dishes since they actually dry them, instead of pushing the water around like some dish towels. Since they’re quite thin, it’s easy to fold and fit them into champagne flutes, wine glasses and vases. There is a fantastic array of colors for you to choose from, and this set definitely gives off an autumn vibe with the flame, marigold and petal shades. Plus, the colors despite being vibrant, rarely fade nor bleed even after many washings. However, these towels might be pretty thin and provides little absorbent, according to some of its users. Different people have different opinions. Still, who can resist these lovely looking kitchen towels? If you’re like me, you will fall in love with this Sticky Toffee Cotton Flour Sack Kitchen Towel Pack at first sight! 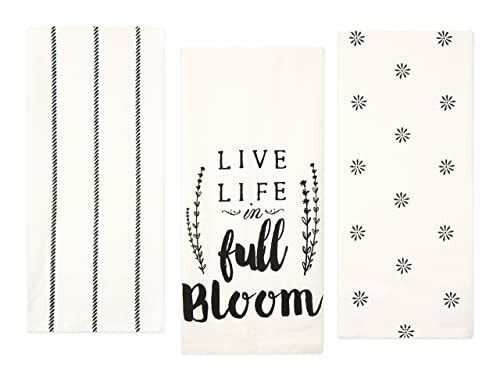 The designs of these towels are simple yet absolutely pretty and adorable, not to mention 3 different designs for each towel. This sets them apart from some other plain towels that are solely for the job of cleaning and are hidden after finish using. These are cute enough to be hung proudly on your oven handle to add a little decoration to your kitchen. They will without a doubt compliment your home regardless of the time and seasons. Besides the look, the towels are perfect as drying and cleaning towels. The cotton towels are well made and highly absorbent as well as being lint-free. What’s more, they can be machine washed and dry with ease, saving you all the hassles. There’s little to complain about these wonderful and festive flour-sack towels. They would be great pieces of decoration for Thanksgiving, Easter or even Christmas. Or simply give them as presents to your loved ones to show how much you care for them! Another great recommendation for those looking for something to give some color and variation to their kitchen – the Room Essentials Flour Sack Towel. The pack comes with 4 hand towels, 2 solid all the way through and 2 patterned on one side for alteration. The color is more of a greenish teal shade, which aren’t any less gorgeous. And there is no bleeding of the color on the counter or after washing. These towels are made in generous size and rather thin, as most flour sack towels are. However, they will become much more absorbent after each wash with no signs of shrinking or fading. The towels are true quality flour sack towels, perfect for drying glasses or the nooks and crannies of your silverware. They are multi-purpose and well stained, since they can hold up well to regular wash cycles and hydrogen peroxide pre-soaking for stains. This hand towel set is absolutely beautiful while keeping the same functionality of regular plain towels. One slight minus is that they are not very square due to the weave, which is a tiny flaw that can be easily overlooked. Last but not least is this Family Love Printed 100% Cotton Flour Sack Tea Towels 4PC, which will surely add love and fun to your kitchen. The towels were beautifully printed with 4 different but equally pretty designs. The delicate rose and family love themes definitely create a vintage, cozy and warm-hearted feeling of a family dinner. Made from super absorbent cotton, these towels are pre-washed to achieve an already soft texture. The hems are bordered meticulously and will not shrink or lose color after using and washing. Some people tend to take family meals for granted. However, family meals especially dinners, play an important role in connecting members and help create wonderful memories together. 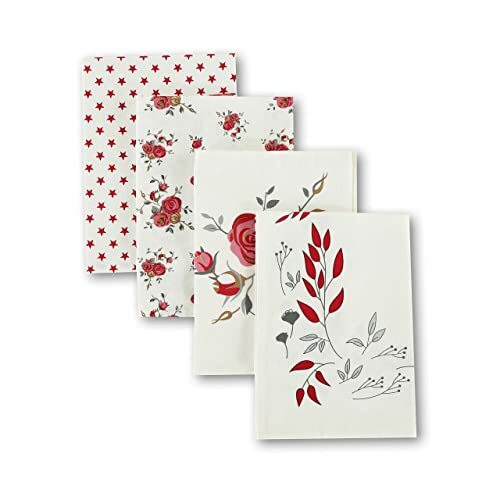 These towels will further enhance their dining experience as well as show how much you treasure such occasions. Who doesn’t want to give their loved ones the best possible experience, even in their daily meals, right? In short, get these towels and prepare a special dinner to surprise your family members. I’m sure just imagine the look on their face will have put a smile on your face already! These towels are without a doubt a great investment in the long run, not to mention more cost-saving and environmental friendly. After reading this review, I hope that you have found for yourself your most favorite flour-sack kitchen towels and enjoy the benefits brought about by these towels.